​The top options selected by EBI yielded a 32.3% return in 2018. 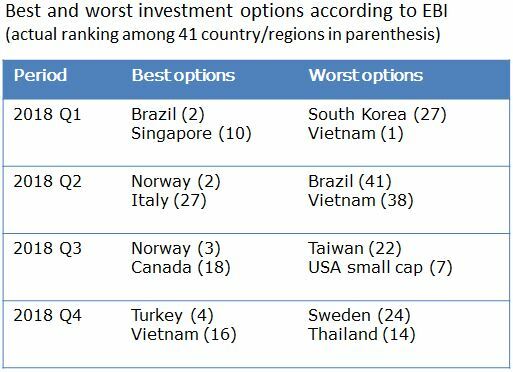 This is the result of investing in Brazil in Q1 (return equal to 6.5%), Norway in Q2 and Q3 (12% and 6,1%, respectively) and Turkey in Q4 (4.5%). As a reference, the mean return of the 41 Morningstar categories used in the anlysis was -10.7% in 2018. The annualized return since the begining of EBI (2015Q4) is 45.0%.